The question is : have you eaten your seven vegetables today? The answer is likely negative unless you had Macédoine de légumes for lunch. Let me explain, the name comes from Macedonia, the country formed by a bunch of smaller states conquered by Alexander the Great and united together. 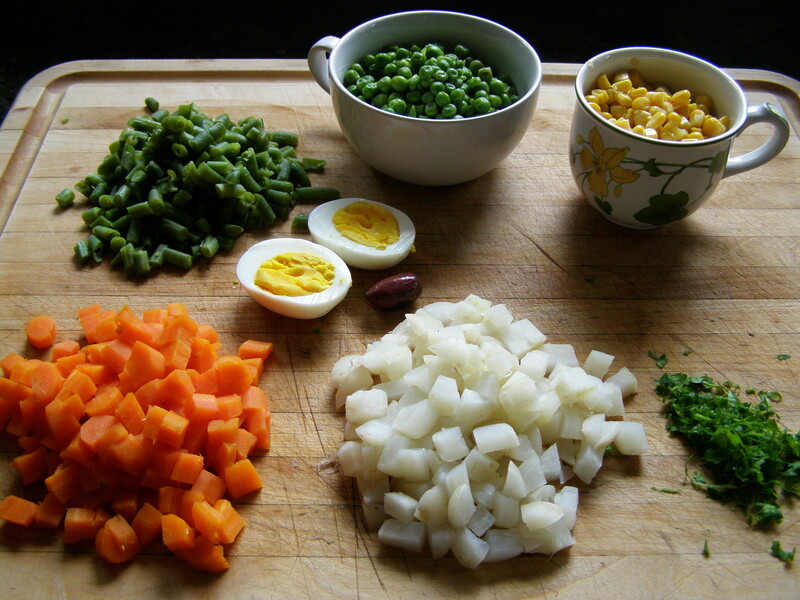 In the food jargon, we are talking of a dish made with many small dices of different vegetables. It can be served hot with butter or cold in a mayonnaise dressing. 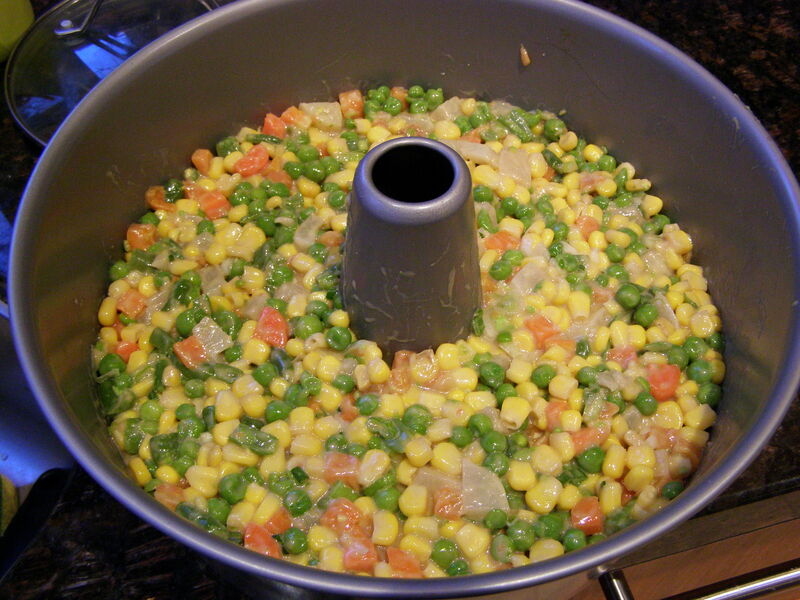 Cook separately, one cup carrots and one cup white or pink round turnips diced, 3/4 cup green peas, 3/4 cup whole kernel corn, 1/2 cup green beans. That is my recipe but some people add potatoes or asparagus tips and the corn was not part of the traditional ingredients as it was not eaten as a vegetable in France until recently. When all the vegetables are cooked, sauté in butter for the hot version and mix with a mayonnaise for the appetizer. 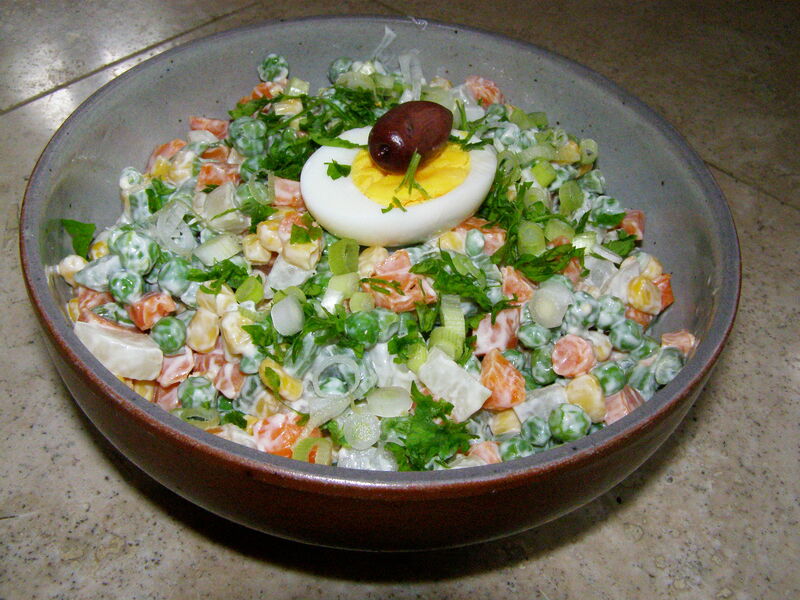 Add a boiled egg on top and sprinkle with parsley and a sliced green onion for a fully balanced lunch. Chill! Details: As much mayo as will fit on a tablespoon is all you need. Serve from a salad bowl or make individual portions by filling a cup and turning it over on a plate as above, and add the egg! It is actually best to cook the vegetables whole and then dice them as they will retain more nutrients that way. 1 carrot, 2 turnip, 3 green bean, 4 peas, 5 corn, 6 green onion, 7 parsley! That’s not counting the Kalamata olive since it is a fruit. 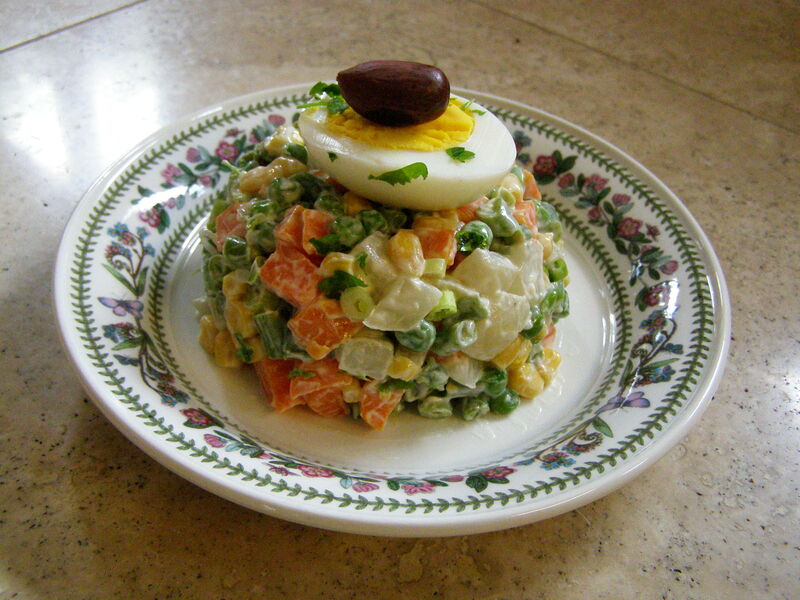 This entry was posted in Lunch, Vegetables and tagged carrot, cooking, corn, food, green bean, lunch, macédoine de légumes, mayonnaise, nutirtion, peas, recipe, recipes, turnip. Bookmark the permalink. the presentation on this dish is superb! I have had so many compliments on this photo! Thank you. Looks great… how did you do that? All in a bowl then capsize? Yes, filled a cup and turned it upside down on the plate. Thanks for the feedback, always fun to read!